Sergeant Michael A. Donaldson (16 January 1884 - 12 April 1970) was a U.S. Army soldier who received the U.S. military's highest award for valor, the Medal of Honor, for his heroic actions during World War I.
Michael A. Donaldson was born on 16 January 1884 in Haverstraw, NY. On 14 October 1918 he was serving as a Sergeant with Company I, 165th Infantry, 42nd Division. On that day at Sommerance-Landres-et St. Georges Road, France, Donaldson's heroic efforts to rescue six of his fellow soldiers earned him the Medal of Honor. 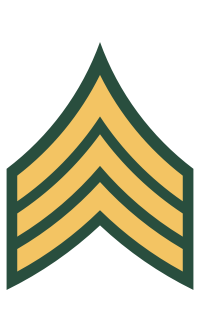 Rank and organization: Sergeant, U.S. Army, Company I, 165th Infantry, 42nd Division. Place and date: At Sommerance-Landres-et St. Georges Road, France, 14 October 1918. Citation: The advance of his regiment having been checked by intense machinegun fire of the enemy, who were entrenched on the crest of a hill before Landres-et St. Georges, his company retired to a sunken road to reorganize their position, leaving several of their number wounded near the enemy lines. Of his own volition, in broad daylight and under direct observation of the enemy and with utter disregard for his own safety, he advanced to the crest of the hill, rescued one of his wounded comrades, and returned under withering fire to his own lines, repeating his splendidly heroic act until he had brought in all the men, 6 in number. Sergeant Michael A. Donaldson died on 12 April 1970 at age 86. He is buried at Saint Peters Cemetery in Haverstraw, NY.